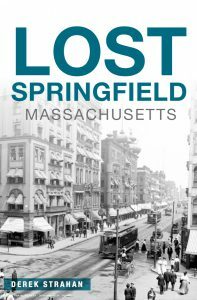 Taken from the same spot as the previous photo, this 1909 photo shows the old Hampden County Courthouse, the Springfield Institute for Savings building, located where the present courthouse is today. Image courtesy of the Library of Congress, Panoramic Photographs Collection. 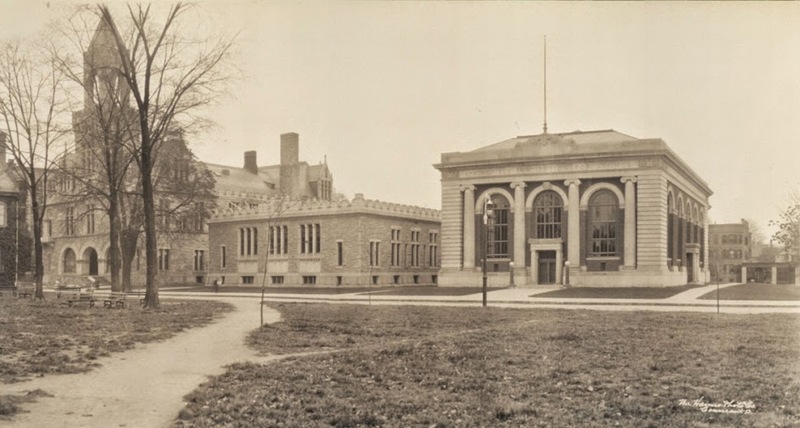 The old 1874 courthouse (now the juvenile and housing court) survives largely intact, although the third floor with its Gothic dormers has since been removed, and the Hall of Records in the center of the 1909 photo has been demolished. 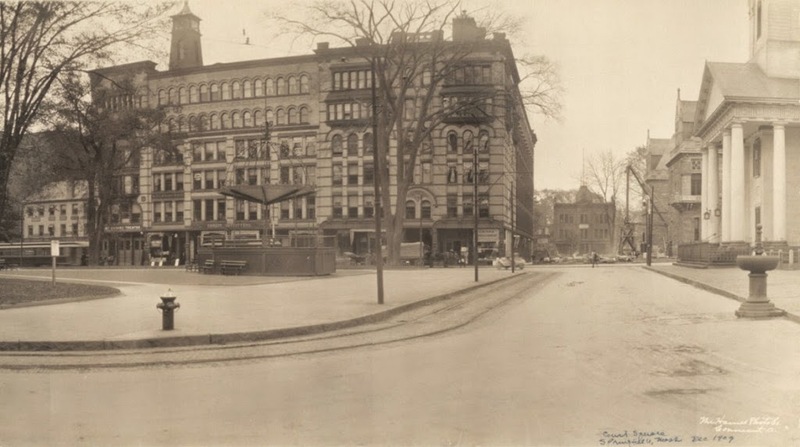 The Springfield Institute for Savings building, on the right-hand side of the photo, has also been demolished, and Elm Street has been truncated, in order to build the modern Hampden County Hall of Justice. 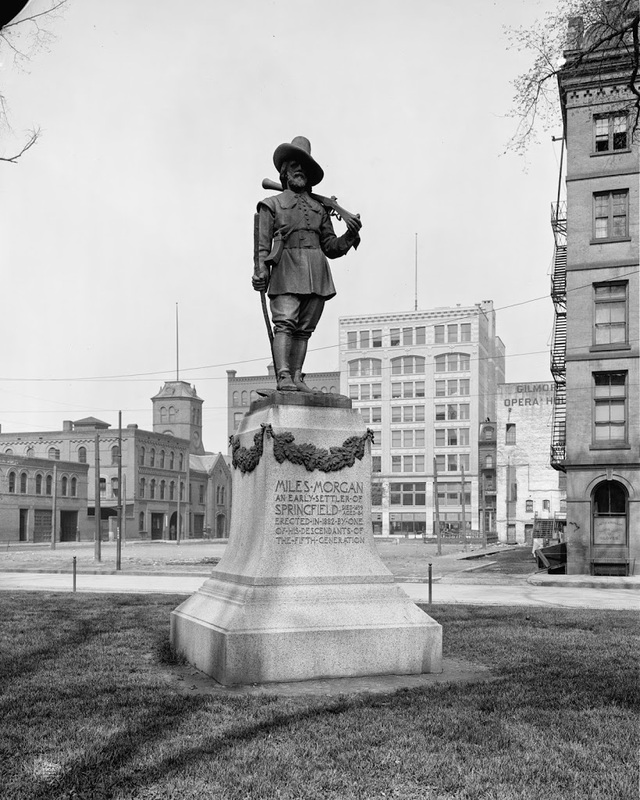 One other interesting addition is the statue in the 2012 photo; it is a statue honoring William McKinley, and at the time of the 1909 photo it was residing in Forest Park across the city. I do not know when it was moved to its present location. 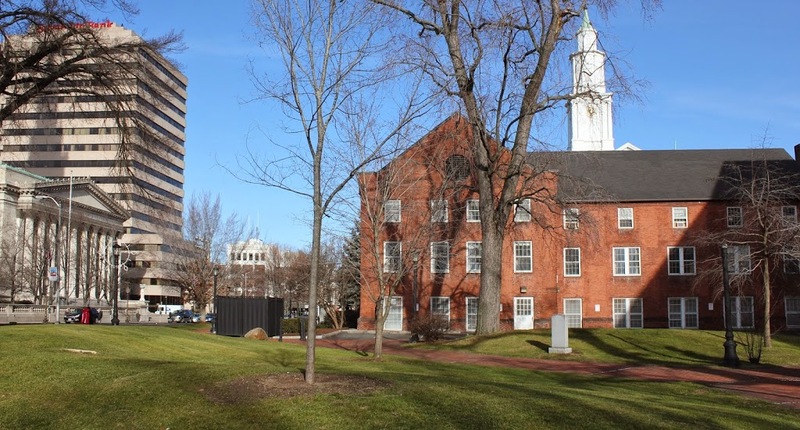 Long before it was the Hampden County Hall of Justice, East & West Columbus Ave., I-91, and a parking garage, the land behind Old First Church was an ordinary city block, until the early 20th century, when it was cleared to create an extension of Court Square. Although this open space was itself carved up for the various projects that followed, the 1909 photo below shows a view of it shortly after it was cleared. Image courtesy of the Library of Congress, Panoramic Photographs Collection. This 2012 photo was taken at close to – although not exactly the same spot. 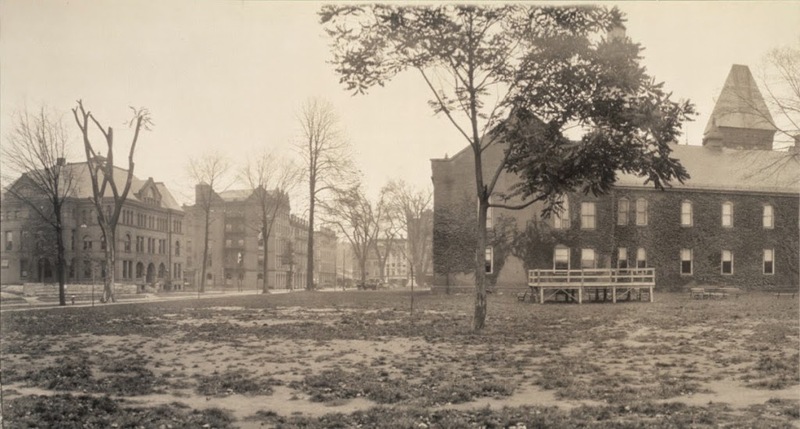 The original was taken from what is now East Columbus Ave., so instead of standing in the middle of the road I took it from the sidewalk, looking at the last remnant of the western extension of Court Square:The rear section of Old First Church factors heavily in both of these photos. As the only surviving building from the 1909 photo, it nonetheless has undergone renovations. 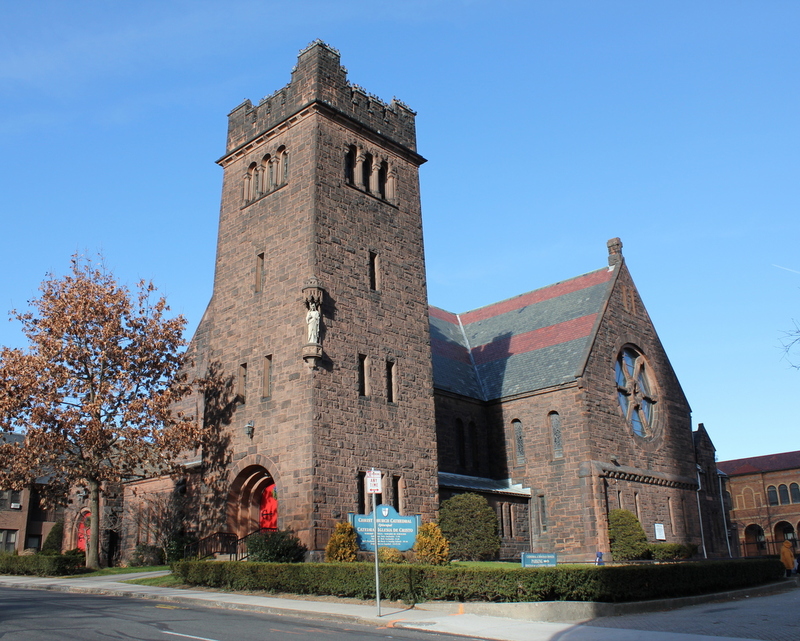 While the church itself is largely the same as it was in 1819, the brick addition, which was built in 1874, shows changes between the two photos. Although it first appears that a third story was added, there was in fact no changes to the height of the structure. Rather, it appears that the entire section was gutted, and rebuilt to allow for three floors. If you look closely, you can see the bricked-up places where the old windows used to be, in between the modern windows. A plaque on the inside of the church indicates that this renovation was done in 1947. Presumably during the same renovations, the brick steeple on the right-hand side was removed. 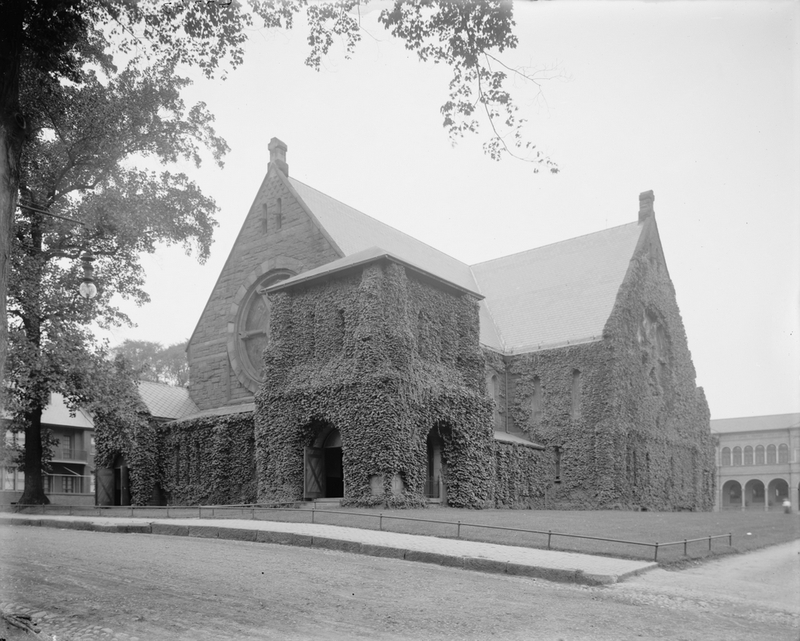 The church’s main white steeple is there in the 1909 photo, although it is mostly hidden behind the small tree in the center. Other than the church though, all of the other buildings in the photo have since been demolished, some of which were where City Hall was built only a few years later. 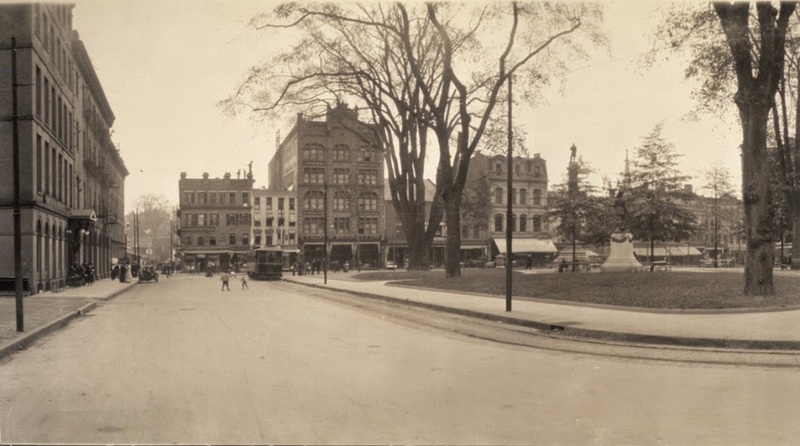 Shown below is a 1909 photo of Court Square looking east, taken at the same time as the photo in my previous post. Image courtesy of the Library of Congress, Panoramic Photographs Collection. 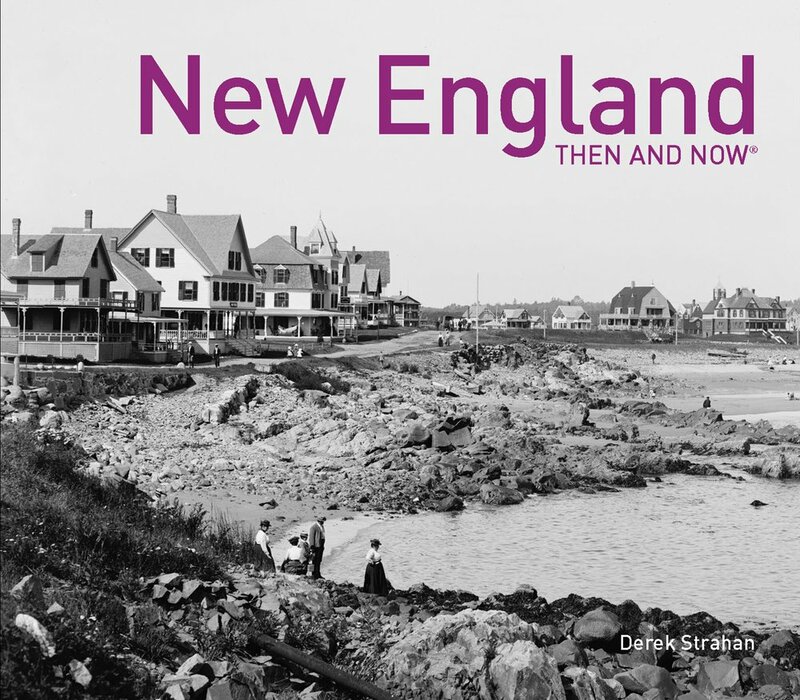 Fast-forwarding 103 years to 2012, the scene has changed dramatically. 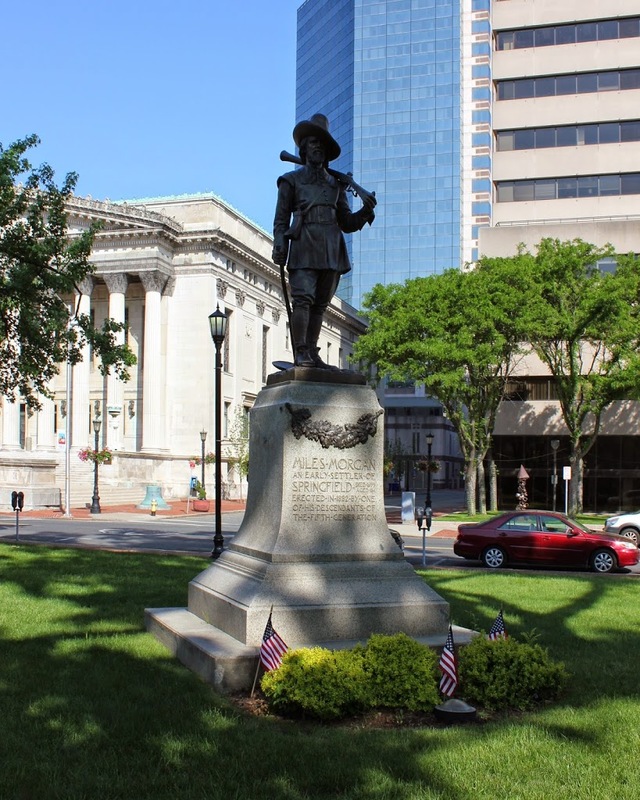 Unlike in the photo of the south and west ends of Court Square, these photos of the west (and a little bit of the north) sides of Court Square have almost nothing in common. 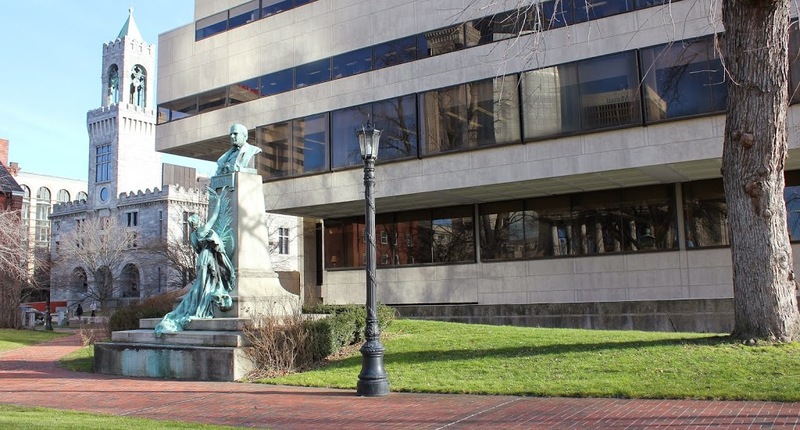 The old Chicopee Bank building, seen in the 2012 photo on the far right, is barely visible behind the tree on the right-hand side of the 1909 photo, and the Miles Morgan and Civil War monuments in Court Square are still there. 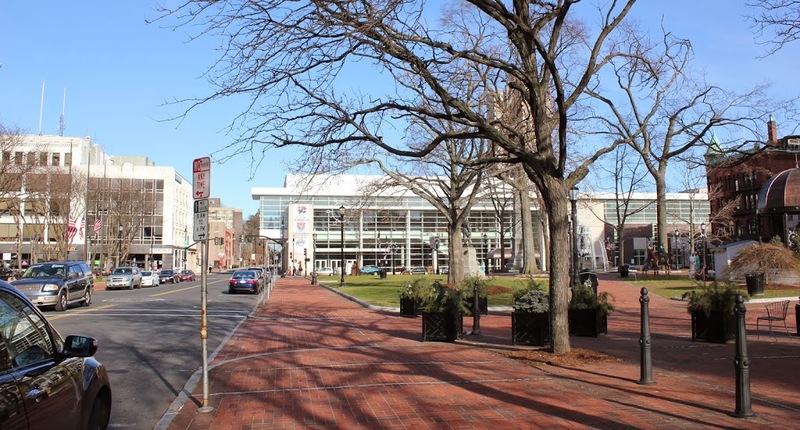 But other than that, everything else has changed, with the most notable difference being the MassMutual Center. Built in 1972 as the Civic Center, it replaced several city blocks, including the buildings in the center of the 1909 photo, although some of those were long gone before 1972. 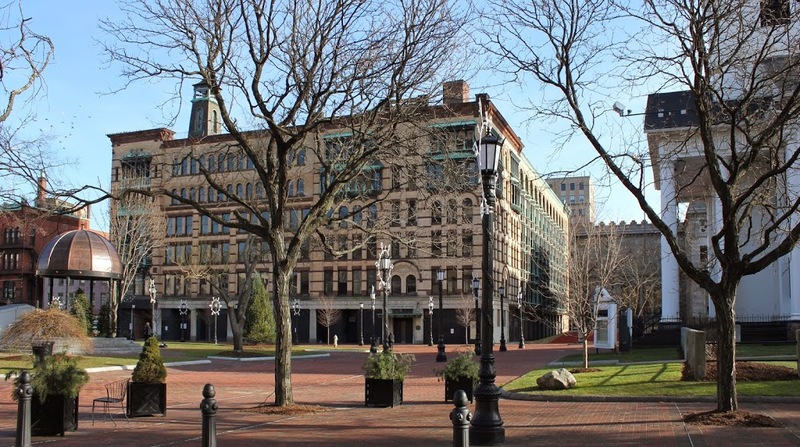 Among the buildings seen in the 1909 view is the old Springfield Republican building, which is the tall building just to the left of center along Main Street.